The singer Madonna has announced she’ll be singing at next month’s final of the Eurovision song contest in Tel Aviv before an estimated global audience of 180 million viewers. She intends to perform two songs, including a new one from her forthcoming album. Would that be the same Jewish Voice for Peace which blamed Israel and pro-Israel Jews for US police brutality against African Americans, thus sliding from its habitual vicious falsehoods about Israel into an antisemitic blood libel? Would that be the same as Caryl Churchill whose 2009 play, Seven Jewish Children, accused the Jews of inflicting upon others through the State of Israel the same kind of extermination that had been meted out to them, rooting this murderous trait in Judaism itself with lines such as this one: “Tell her I don’t care if the world hates us, tell her we’re better haters, tell her we’re chosen people”? What oppression would that be? The corruption of the Hamas regime in Gaza causing shortages of food and essential supplies? So the New Statesman decided to interview Sir Roger Scruton. Perhaps there are those who think that Scruton should not have agreed to be interviewed by the New Statesman, the left-wing magazine being unlikely to conduct a fair interview. But Scruton was the magazine’s wine columnist for many years, and under the editorship of Jason Cowley the magazine has been a slightly fairer and less battily leftwards publication than it was of old. But today the magazine’s deputy editor, George Eaton, took to social media to announce the results of what he is parading as a ‘gotcha’ interview. The interview – which Eaton conducted himself – was, he promised, positively crammed full with ‘a series of outrageous remarks’. Eaton later posted a picture of himself drinking champagne to celebrate the fate of his interviewee, with the caption “The feeling when you get right-wing racist and homophobe Roger Scruton sacked as a Tory government adviser.” Eaton has since deleted the picture. Here it is. So what are the ‘outrageous remarks’? It appeared that Scruton had said that Islamophobia is ‘a propaganda word invented by the Muslim Brotherhood in order to stop discussion of a major issue’. Which is true. He also said that ‘Anybody who doesn’t think that there’s a Soros empire in Hungary has not observed the facts.’ A fact which is also true. Obviously since the British Labour party became a party of anti-Semites it has become exceptionally important to pretend that anti-Semitism is equally prevalent on the political right in Britain and that to criticise any of the actions of George Soros is in fact simply to indulge in anti-Semitism equivalent to that rolling through the Labour party. A very useful play for the political left, but wholly untrue. Anyway, I say ‘it appears’ that Scruton said this because there seem to be a few journalistic problems here. Though Eaton says that Scruton said the above I am not confident that this is so. For Eaton – who used to be the Statesman’s political editor – appears to have a somewhat Johann Hari-esque way with quotes. He claims, for instance, that what Scruton said about Soros was somehow a comment ‘on Hungarian Jews’. As though Scruton had attacked all Hungarian Jews, rather than one very influential and political man who happens to be a Hungarian Jew. Writing in the New York Times, Anouar Maji and Yaelle Azagury have produced a nuanced view of Morocco's relationship with its Jews. The King is rightly applauded for preserving and promoting Jewish heritage. The writers blame 'European colonialism, the creation of Israel and the emergence of Arab nationalism, imbued with elements of anti-Semitism, for dividing the Jewish and Muslim communities'. But the causes of the mass exodus predate the 20th century. European colonialism was in the main good for the Jews, as it liberated them from centuries of 'dhimmitude' and forced conversions.There were a few privileged financiers and courtiers, but popular feeling was very often anti-Jewish, leading the Jews being locked into ghettoes for their own safety, and to more pogroms than in other parts of the Arab world. A Labour council candidate in Lancashire has been suspended after allegedly antisemitic social media posts were flagged to the party, according to a report. Harry Virco will be standing in next month’s Fylde borough council election despite his suspension as it was too late to remove him from the ballot paper, The Times reports. A party source told the newspaper that were Virco to be elected, he would sit on the council as an independent. A tweet sent from Virco’s account last year said: “Has Israel & the Jewish people learned nothing from their persecution under Hitler? It has emerged that in 2011, Jeremy Corbyn defended eight schools’ plans to send children to a festival featuring a vandal who daubed “Free Gaza and Palestine” on the Warsaw ghetto. 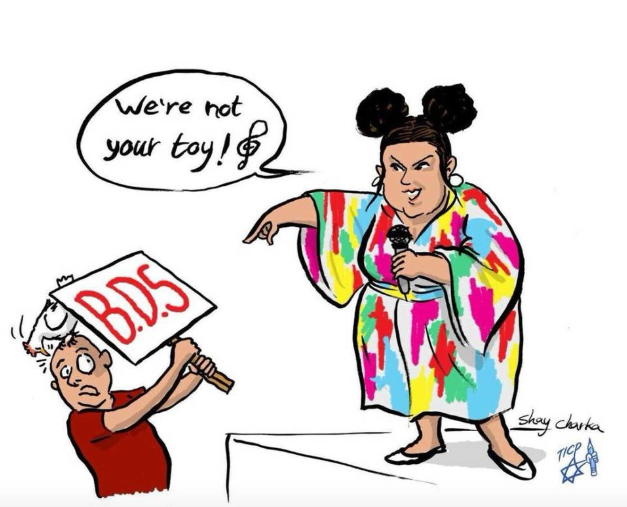 Eight primary schools had intended to send children to the Tottenham Palestine Literary Festival, where speakers included Ewa Jasciewicz, who spray-painted “Free Gaza and Palestine” on the wall of the Warsaw Ghetto. According to a report in The Times, in 2002 Ms Jasciewicz called for “activists” to “do” the Israeli parliament or “a sophisticated politician bump-off” rather than targeting Israeli civilians. Several anti-Semitic fliers were found on bookshelves and tables in a library at the University of North Carolina. Benjamin Pogrund — a pioneering journalistic opponent of South Africa’s former racist system of apartheid who now lives and works in Israel — will be presented with the Order of Ikhamanga in Silver, given to those with outstanding records in the spheres of art, journalism, culture and literature. Pogrund will receive the medal from South African President Cyril Ramaphosa in a special ceremony on Apr. 25. A former editor of the liberal Rand Daily Mail, Pogrund in the past enjoyed friendships with prominent leaders of the movement for black majority rule in South Africa, including the late former President, Nelson Mandela, and the late founder of the Pan Africanist Congress (PAC), Robert Sobukwe. A consistent thorn in the side of the apartheid regime for its exposure of the brutality faced by black South Africans at the hands of the security forces, the Rand Daily Mail was forced out of business in 1985. The following year, Pogrund emigrated to London. In 1997, Pogrund made aliyah to Israel, where he founded the Yakar Center for Social Concern in Jerusalem. Much of his work in recent years has focused on fighting the anti-Israel BDS movement, particularly by challenging the analogy made by anti-Zionist activists between modern-day Israel and apartheid South Africa. When Democrats failed to explicitly rebuke Congresswoman Ilhan Omar (D-MN) for her antisemitic remarks, they sent a disturbing message beyond the Beltway — namely, that it is acceptable to use antisemitic tropes without facing any consequences. This was the latest sign of the normalization of antisemitism, which is also reflected in the tolerance of antisemitism on college campuses, and the effect that it is beginning to have on younger Jews. I recently met with a group of high school students, and asked if any of them had experienced antisemitism at school. Shockingly, 18 of the 20 (one was not Jewish) raised their hands. One young woman said that a kid in her class “said something to someone next to me about how he was going to hire a Jewish lawyer to take all of his money.” In another instance, he told her “he loved Hitler.” When she asked him to stop making these comments, he laughed. An allegedly antisemitic comment apparently made by Matthew Scott, the former Head of Music at the National Theatre, is being investigated by police after a complaint was made, according to The Daily Telegraph. Mr Scott was Head of Music at the National Theatre from 2006 until 2016 and remained there as a music consultant until the end of last month. He is currently Emeritus Professor of Composition in Music at the University of Southampton. It is hard to imagine how “the completion of the cleansing process” could be understood as anything other than a call for the genocide of Jews in Israel. Additionally, under the International Definition of Antisemitism adopted by the British Government, “Denying the Jewish people their right to self-determination (e.g. by claiming that the existence of a State of Israel is a racist endeavour)” is antisemitic. An Instagram page created by Nokia fans has unwittingly touched a nerve among Israelis after it used a picture of soldiers crying in a funeral. The page nokiamobile_official, which is not officially linked to the phone giant, posted the controversial picture, showing soldiers sobbing at the funeral of their comrade Ilan Swiatkowski, who was killed by terrorists on the Gaza border in 2010. Thirty-nine of France’s leading intellectuals have signed an impassioned editorial in one of the country’s leading newspapers calling for the killer of Sarah Halimi — the 65-year-old Jewish widow brutally murdered in her Paris apartment in an antisemitic attack — to finally face trial, more than two years after the crime was committed. The editorial, published on Monday afternoon by Le Figaro, carried the signatures of several high-profile writers and academics, including philosophers Élisabeth de Fontenay, Alain Finkielkraut and Elisabeth Badinter, and historians Pierre-André Taguieff and Jacques Julliard. Journalist Noémie Halioua, author of the first detailed account of Halimi’s murder and its political fallout, was also among the signatories. Prompted by the appearance of a new psychiatric report claiming that Halimi’s killer, 29-year-old Kobili Traore, is mentally unfit to stand trial for murder, the editorial detailed at length the sorry timeline of events from her murder in the early hours of April 4, 2017 to the present impasse in the French legal system. The editorial argued that “in the hours and days before the crime, the police learned that Traore had frequented the Salafist mosque on rue Jean-Pierre Timbaud,” and that he had subjected both Halimi and her visiting relatives to antisemitic insults in the hallways of the public housing building in eastern Paris where both killer and victim lived. The following is a new report in a series from the MEMRI initiative researching online incitement against Jews, people of color, Muslims and the LGBTQ+ community. Government, media, and academia can request a full copy by writing to media@memri.org with the title of this report in the subject line. Pennsylvania lawmakers on Wednesday honored the memory of the 11 Jewish worshippers who were killed in October 2018 at the Tree of Life*Or L’Simcha Synagogue in Pittsburgh. Roth’s alternative history novel takes place in an America in which Franklin D. Roosevelt was defeated in the presidential election of 1940 by pilot and Nazi sympathizer Charles Lindbergh. The novel follows the fortunes of the Roth family during the Lindbergh presidency, as anti-Semitism becomes more accepted in America and Jewish-American families like the Roths are persecuted. The narrator and central character in the novel is the young Philip, and the detailed and honest depiction of his confusion and terror make the novel more about the Roth’s own boyhood than American politics. The novel imagines an America in which Lindbergh’s isolationist ideas have become the national agenda, and are impacting Jewish life in Newark, New Jersey. The novel depicts the Weequahic section of Newark, which includes Roth’s Weequahic High School, from which graduated. The main cast includes John Turturro, Winona Ryder, Zoe Kazan, Morgan Spector, Anthony Boyle, Azhy Robertson, and Caleb Malis. Members of Israel’s Olympic judo team on Monday expressed their dedication to representing their country in the world of sports, despite facing anti-Israel sentiment at major international competitions. Judokas Ori Sasson, Sagi Muki, and Peter Paltchik who won the silver medal at the New York Open Judo Championship on April 6, are visiting the US on a tour of college campuses. Schools at which they’ll perform judo workshops and share their stories of overcoming discrimination will include Rutgers University, University of Delaware, and the University of Pennsylvania.